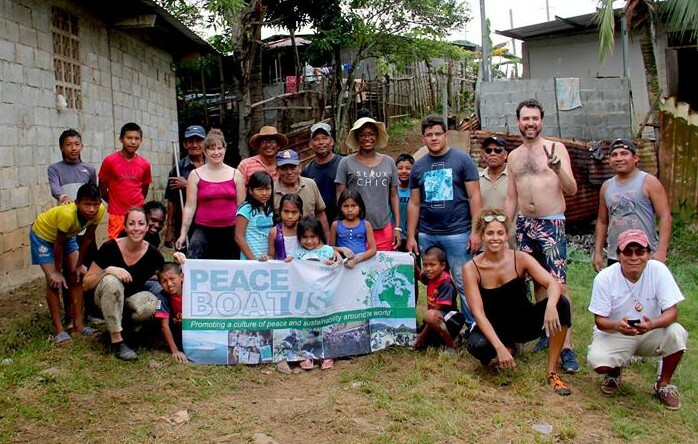 Between Cristobal, Panama and Puerto Quetzal, Guatemala, Peace Boat US will host an onboard forum in which international participants will discuss ideas and initiatives for sustainable development, while meeting, learning from, and working with local communities. During Peace Boat’s 88th Global Voyage, the Peace Boat US program, Music and Art Peace Academy (MAPA), will work with three other NYC-based NGOs to support the indigenous Kuna community of Panama, in partnership with Kuna community leaders. The project comprises two parts: first, fundraising to help supply construction materials requested by the Kuna community, and second, a group of youth activists from the NYC area to join the Peace Boat October 24-29, during which they will produce a short documentary about the project, and their experiences onboard and in Panama visiting the Kuna people. Click here to read more. 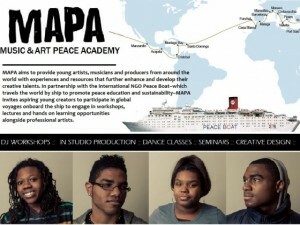 MAPA, a Peace Boat US program that aims to bring young artists onboard Peace Boat voyages to develop their capacity for artistic expression encompassing the issues, cultures, and people they encounter through international travel, will bring students from the Brooklyn Community Arts and Media High School onboard the 84th voyage for a one-week passage through Central America. The students will visit El Salvador, Panama, and Nicaragua. Onboard, they will undertake an ambitious video and multi-media documentary project, while in ports they will join study programs with local communities. The Permanent Mission of El Salvador to the United Nations and Peace Boat US are requesting donations of used and new musical instruments to deliver to the Centro Escolar District Italia School in El Salvador. The instruments – wind, string, and percussion instruments of all kinds – will support youth music education. Instruments need to be collected by July 31, and delivery will take place during Peace Boat’s visit on August 1-2, during the 84th Global Voyage. Please contact us for information about how to transport and/or deliver the instruments. The instruments will be hand-delivered by students from the Brooklyn Community Arts and Media High School, who will travel to El Salvador to join Peace Boat’s 84th Voyage for a one-week program with the Music & Art Peace Academy (MAPA). In El Salvador, the students from Brooklyn will work with local students to learn about and create music inspired by indigenous culture. Peace Boat’s Disaster Relief Volunteer Center is undertaking an emergency relief operation in response to Hurricane Haiyan / Yolanda. 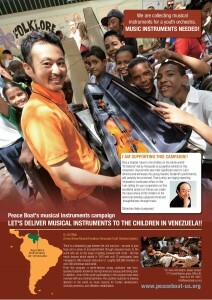 Peace Boat US is joining the effort to gather musical instruments – strings, brass, percussion, accessories, etc – to support the El Sistema project that engages youth from low income and poverty stricken communities with the world of music. Around 300,000 youth have participated in 200 orchestras around the country since 1975, and the need for more instruments is tremendous. This project to donate musical instruments was started by Peace Boat, the sister organization of Peace Boat US, in 2007 upon their first encounter with the world famous music project. In response to the devastation caused by Hurricaine Sandy, Peace Boat US, our Japan-based partner-organization Peace Boat, and a number of local organizations coordinated a relief project for various neighborhoods that remained without essential services days and weeks after the storm. 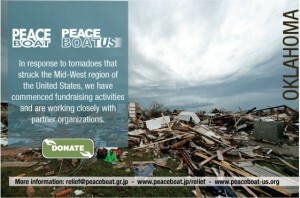 Please read more about Peace Boat US’s efforts here and here. Immediately following the devastating earthquake and tsunami of March 11, 2011 in Northeast Japan, partner organization Peace Boat was one of the first and most extensive civil-society organizations to respond. Peace Boat US supported these efforts through fundraising and organizing public information events in order to raise awareness about the human impact of the disaster and report on disaster relief efforts. Please read further about the continuing clean-up and reconstruction efforts by Peace Boat in Japan, Peace Boat’s blog by participants in the relief projects, and 2011 Activities Report. Peace Boat US and Japan-based partner organization Peace Boat are commencing with relief support efforts for the communities in Oklahoma struck by massive tornadoes on May 20, 2013. All of us were deeply saddened to hear of the loss of life and devastation caused by the tornadoes that struck the Mid-West region of the United States in recent days. We would like to offer our condolences to all of those affected and extend a hand of friendship and support in these difficult times. In response to this disaster, we have commenced fundraising activities and are working closely with partner organizations in the United States in order to deliver effective assistance to those on the ground. Further updates and developments from the afflicted areas will be posted on our website as the information becomes available.